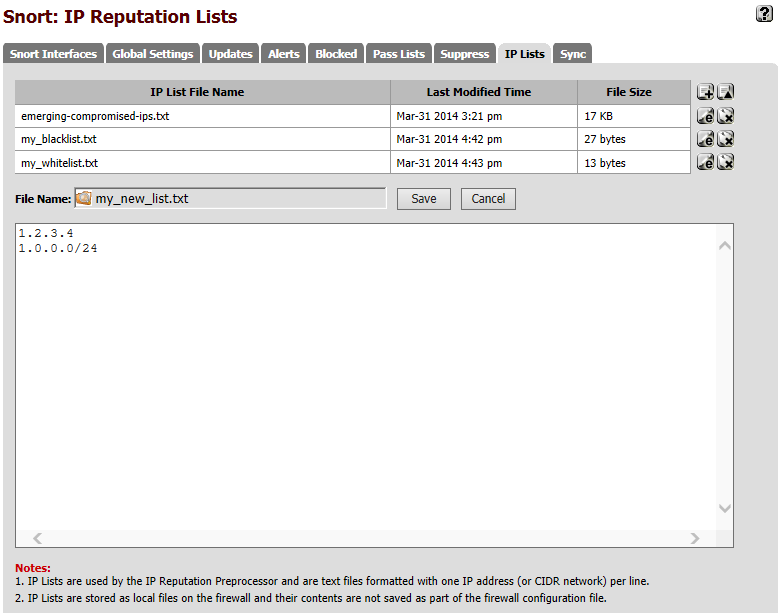 Use this tab to manage the IP lists files for the IP Reputation preprocessor. IP lists are text-format files containing one IP address or network (expressed in CIDR notation) per line. To upload an IP list file to the firewall, click the icon to open the file upload dialog as shown below. Browse to the file on the local machine using the BROWSE button, then click the UPLOAD button to upload the file to the firewall for use by the IP Reputation preprocessor in Snort. To create a new IP list, click the icon. To edit an existing IP list, click the icon beside the list to edit. Click SAVE when finished to save changes to the list, or CANCEL to abandon any changes.